Let me ask you a question - why does a Linux distribution need release cycles? A software release is the distribution, of a new and upgraded version of a computer software product. Each time a system or a software program is changed, the developers and the company (or community) doing the work decide on how to distribute the software (or the latest changes to the software) to the users (customers or community members or general public). Software patches are one method and the full package (full OS and/or software including the patches and changes) is the other. Generally a distribution undergoes a release cycle such as: pre-alfa, alfa, beta, release candidate, general release and the boxed copy. A release cycle is necessary to be on the edge of the latest stable software. PCLinuxOS repository keeps itself always updated with the latest in the Linux World. The users can easily update their systems online, so there is no need to download the full bundle. It's tiresome. By the way, every release of PCLinuxOS is so stable, up to date and usable that any desktop user can have happy computing for quite a long time (till a major release), even without installing the updates. PCLinuxOS has a unique approach to releases (and updates). Each of its release comes with some major updates, so that the user can feel the difference in the Linux world in general (between two consequitive releases) and PCLinuxOS in particular. That's why there are discernible changes among PCLinuxOS 92, 93 (Big Daddy) and 94 (2007). In other Linux distributions (Ubuntu, Mepis, Fedora, Suse...) you will hardly find any major difference between two releases, except for some change in software update numbers. PCLinuxOS has no set dates for releasing. This helps the developer and the community to be patient and work on the distro steadily to offer a really stable and usable distro, when they are at all satisfied after much alpha, beta and release candidates. Hence, every PCLinuxOS release has very less number of bugs compared to other distros. Frequent Release Cycles create chaos in Linux User Community. They feel the urge to update (though for not worthwhile benefits). And they spare much work-hours in tweaking the system, updating, installing and configuring. The actual productive computing is ignored. But late and stable releases help users to work on a usable system and forget about the update thing, till a really major release knocks in. As of now, I think the next PCLinuxOS release will be groundbreaking with stable KDE4. So, I would tell every Desktop Linux User to get back to life and work on PCLinuxOS 2007, than trying the minor updates of Gutsy, Herdy, Celena, bla... bla.... bla…..
Linux desktop has many edges over Windows, but let's agree a few of them are rough. I love Linux but I respect the feeling of some Linux converts (specially millions can't be wrong when they say it ROUGH). One of these rough edges is: cryptic software installation (if the users don't have knowledge of the Linux and/or don't have access to the Web and/or 'confusing nomenclature' of the software packages). Linux becomes the best desktop (and server) in sync with the Web. Linux developers are more internet-savvy than their Windows counterparts. Linux people spare more time on the Web sharing codes and peer-review. Perhaps this web-savvy nature has lead them to think that all the desktop users under the sun use the Web (or have access to it). But in reality a few of the poor users don't have access to the Web. So how can they resolve rpm dependencies, browse forums for help, and update their systems? Well, here is a minimalistic approach to software installation after which you can have a smooth PCLinuxOS computing (alongside Windows XP, if it's installed on another partition of your hdd) even if your PC is not powerful. Here under is an optimized list of packages (much of the potato cheaps removed, and some real meats added) in presence of which you can do the regular office chore, have a great multimedia experience, work in sync with your Windows ntfs partitions, and find yourself in a sober but sophisticated desktop environment. Just query your packages list (type rpm -qa in a terminal), match the screen output (it's the list of packages present in your PCLinuxOS) with the list packages mentioned below. Remove the extra packages you have in your system. Make a list packages that your system lacks. Access the web for just once and download all those packages. Install them. That's it! Now you have a optimized set of applications that's just enough to do any home desktop job. Let’s discuss how to manipulate images in this post. The easiest tool pclinuxos has for taking screenshot is fbgrab. Just issue: fbgrab filename.png in the commandline, that’s it. Fbgrab produces only png image shots. Else you can use import command (from imagemagick suite). Import produces screenshots in jpg, png and bmp. Choose the one that suits best to your screenshot color depth. To take screenshot of a particular screen issue: import screenshot.png you cursor will turn into an crosshair, drop the cursor on the section you want to capture. 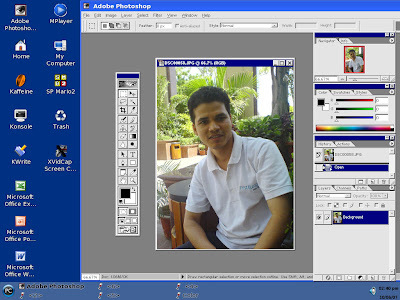 ImageMagick is a small but versatile suite to manipulate images. It comes as default in many linux distributions. In this example, watermark.gif is the watermark, image.jpg is the image to watermark, and image-watermarked.jpg is the newly created image. You can also create a script to automate watermark creation for your web gallery. This command will display images in that directory in alphabetical order. Spy der Mann (a.k.a. M) came my way! And surprised me with his agonies (of windows experience) and ecstasies (of pclinuxos joyride). Somewhere in the innermost corners of evolved PC users there lives an M, who just can't settle for mundane things of computing (like windows), and must find his way through nobler things (linux in general and pclinuxos in particular). Thanks M! You represent millions of evolved pc users through your nice posts on slashdot. I don't want to dilute your feelings. So, I am posting them as they are. My viewpoint on Windows after switching to Linux. Remember this borg guy called Bill Gates? Well, I'm finally free from him, and from everything that he represents. I'd like to share a thought with you guys. Perhaps it might help someone who's doubting on switching to Linux . The original post was written on one of the Microsoft stories. Everytime Microsoft plays dirty on you is a reason to switch. Yesterday I switched to Linux from Windows. My Linux of choice was PCLinuxOS, which I find powerful and yet guiding (you can read my review on my journal). Anyway, what I wanted to share is that when I used to be a prisoner - and slave - of Windows, everytime I read these news on Slashdot ("Microsoft forces this update on you! ", "Windows phones home", "Windows spies on your browsing habits", "Windows antipiracy measures screw up your install"), I used to get irritated and mad at Microsoft. But just today, I felt very different when reading these news. For the simple reason that my main install is Linux. How? Well, let me tell you how I felt. Being a V for Vendetta fan, I can compare with the feeling Evey had when she was under the rain, after having decided to go against the system, to the last consequences. Her thoughts and actions were completely free from the government. I can tell how she felt. It was a feeling of freedom. It was a feeling of power.It was a feeling of being able to fight against the Statu Quo. I wasn't part of the system anymore. I felt like Neo after going in the matrix and realizing I *CAN* change things. I was no longer a victim. I was no longer a survivor. I became... a fighter. I no longer need to hack my way through Microsoft's limitations. I no longer need to download a crack to bypass the stupid region encoding or DRM imposed by Windows just to backup my movies or music CDs. I no longer need to fear the dreaded Windows update screwing up my system. I no longer fear the waste of time of installing, re-registering and cracking Windows "Genuine Advantage" every time I upgrade my hardware. For ages, I had complained about our slavery to Windows and the lack of Linux user-friendliness that kept us in that slavery. And now I feel that PCLinuxOS had build the bridge that I needed to do the switch. To put it in biblical terms, PCLinuxOS was, at least for me, the Moses we needed to get away from the evil Pharaoh. I am beyond Windows now. I have transcended. I am immune. I am free. Now, does that mean I'm going to become another of those elitist Linux "fanbois" that blame everything on the user? Hell no! The path towards freedom is still very rough, and I'm convinced that the more cross-platform applications there are, the easier that path will become. And I said path towards freedom, not towards Linux. Because when ReactOS comes out, it will be the same freedom - but with a different choice. You can't promote freedom with a dictatorship. You need to let people choose. This power, this freedom, this liberty, is a feeling that can't really be explained. You NEED to experience it. After you do, you will never go back. So, if you decide to switch, and if Ubuntu doesn't meet your expectations, try PCLinuxOS. Just don't be an idiot like I was, and backup your data. You need to do it, anyway! I sigh with relief now. We're living interesting times. Every year that passes, Linux gets better. And friendlier. I can see it... Microsoft's doom is approaching - it's very close, just waiting for something to happen. Soon Microsoft will fall. All empires do. And I feel grateful for being an eye-witness. Goodbye, Microsoft. You will never be missed. Goodbye, Windows! Good morning, PCLinux OS! This is the sequel to my previous disappointment with Ubuntu Linux. I tried to install PCLinux OS 2007 from a burned ISO I downloaded. Everything worked fine, until I rebooted. Another error 17. But behold! The LiveCD included a chat application (XChat), which automatically connected to the PCLinuxOS support channel! There I met a guy who explained to me that I had my partitions wrongly set up. He told me everything I needed to know - the partitioner was really cool, there was an option to autoallocate that created your root, home and swap partitions. I repartitioned, rebooted, and voila! :D I'm in Linux! No more error 17. Some apps weren't up to date, like GTK 2.0 and the drivers. Fortunately, the chat guy told me what to do about the drivers. There was no commandline at all! Everything was done graphically. There was something wrong when I updated the screen to 1280 x 1024 (i was suddenly in text mode - eek! ), but a reboot fixed it. Also, i had remembered the startx command that booted up. Well, it's still in beta, so I hope by the next version these glitches will be fixed. The next problem was accessing the Windows partitions. Unfortunately, the partitions weren't enabled by default, but clicking on the "advanced" tab on the Administration Center / Partition thingy showed me how to enable them. I clicked on "mount", and voila! Synaptic installs everything for you - no need to reboot except on special rare occasions. I installed Pidgin, and copied my buddy icon from my old windows partition. Still, I miss the MSN custom emoticons. This is one thing I'll have to do without. But I can't base my freedom on my personal tastes. Since I have often to use the console (i find the "My computer" stuff ackward and slow), i right clicked on the Konsole icon and a menu popped up. Oh, didn't I metion? The window manager is very similar to Windows. Specially if you choose the "Redmond" theme (wink wink, nudge nudge). So, I clicked on "copy to desktop", and ta-da, there was my lovely terminal on the desktop. Firefox is installed by default, but I forgot to import the settings from my old account (oopsie), so I have to add my bookmarks by hand. What a pity. Or was that option in Ubuntu and not PCLinuxOS? I forgot - sorry. Anyway, the flash plugin is already installed by default, so whee! I can watch my favorite youtube clips, like Silent Hill Chibi Edition, or some of the Bleach AMV's. Amarok doesn't have the winamp interface, but the player looks similar to a simplified version of Winamp. It doesn't have an "open" button, but if you click on the playlist, the full window appears and you can choose stuff. Looks very advanced - too much for my taste, but oh well. Now, for the downsides: The font for textboxes on Firefox looks awful. I couldn't reboot to the Windows partition - I'm stuck on Linux for the moment, but I can access my files, so it's no big deal. Anyway a boot from the Windows CD will fix the problem if I want to go back. I really hope i can find some tech support that will fix my boot manager. .... and that's about it. The task bar looks weird with those HUGE icons, but these are minor details. Another thing that has kept annoying me is that the numpad, when used with shift, returns numbers instead of the cursor actions. I'm accustomed to using it. This is one thing I hadn't liked about Linux. Well, it's all about upgrading packages and installing replacements for Windows ones now - The OpenOffice is 2.2, and I want 2.3 - and I need an html editor for my webpages. I had tried running the other one with WINE (wine hapedit.exe), but the font's all messed up. It's better to use native linux apps - they work out of the box. It's hard to imagine that Linux is THIS easy. All those misconfigurations, application crashes are a thing of the past. The setup, altho difficult for non-standard settings like mine, was swift thanks to the live tech support on the irc channel. M, not only you are a techie, but a great scribe. Linux community needs such convincing bloggers like you. As far as I remember, books and magazines on Linux have contributed much towards Linux adoption. My Linux mania was fueled by such magazines and books. Years back I used to become very happy buying a Linux magazine, reading the usable tips and then playing with my vintage machine with the distro CD that I got free with those reading stuff. 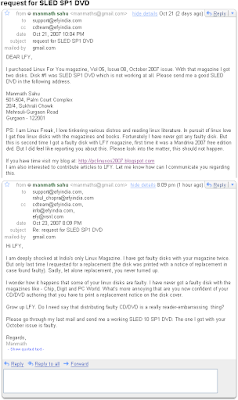 When "Linux For You" (LFY), an Indian magazine on OSS and Linux was launched, I really appreciated it. After all, it was supposed to further the Linux knowledge in Indian subcontinent. But pitiful, this magazine has been distributing substandard Linux disks with the magazine. The story does not end here, this magazine does not entertains any of the user queries regarding replacement of those faulty/substandard disks. So, next time you purchase any "Linux For You" magazine. Please don't purchase it for the sake of its free CD/DVD. 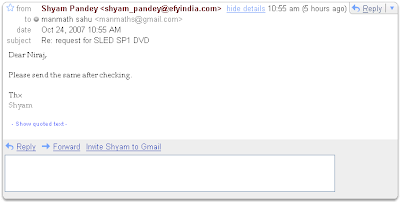 Here is a screenshot of my query and a reminder, to which LFY did not bother to respond. Revisiting "10 reasons to try PCLinuxOS"
In that page I liked the backgrounding to PCLinuxOS by the author, Gfranken. Especially his experience with Mandrake, and information on Texstar were very faithful accounts. Gfranken concluded the page with "10 reasons to try PCLinuxOS", that's what I liked the most. Those 10 reasons were so true and inspiring that I could not help stop myself from gluing my experience to them. Those reasons justify why PCLOS superseded its parent, Mandriva. Hope this post will inspire many wannabe users to try PCLinuxOS, a productive desktop Linux. It's drop dead gorgeous, and very professional looking. I tried PCLOS from its .92 stage. Graphically it was better than the Mandriva (and other KDE-centric distros). The default themes, panels, control center and almost everything were really good, but you could still customize that as per your fancy and get better results. PCLinuxOS developers have pushed this look-n-feel factor very high in the 2007 final version. The look of PCLinuxOS 2007 is fanciful yet very professional. The Beryl/Compiz 3D acceleration effects are terrific--much better than any other distro I've tried. The Beryl/Compiz effects did not work on my VIA/Intel hybrid PIV PC with 32 MB shared graphic memory. But I was so sure of its glamour that I purchased a used NVidia (128 MB) graphic card and configured it on my PC. The result was really stunning. What's more, the 3D effects were so well integrated that it worked on very less system resource. But I had some problem in configuring NVidia in Mandriva, Ubuntu and Fedora. Hats off to Tex! The repository has over 5000 packages, and updates are incredibly prompt, smooth, and easy to do. Synaptic, the GUI package manager works easily and reliably with the repository's RPM packages. Dependency issues are usually well handled. All the development programs and libraries are up to date. I have no complains, I always get what I need, from the repositories. I have witnessed PCLinuxOS repository enriching over the years. I am not sure whether the repository is deliberately planned for desktop users, they will never be sorry for what they are looking for. Of course, there were some downtimes in the repository servers. But they soon became up and running. An up to date KDE version (3.5.6). KDE is the most happening desktop environment in Linux world. Though I have always liked GNOME for its simplicity and responsiveness, I fell in love with PCLinuxOS-KDE connection. It's clean, fast and up to date. The distro never went out of its way for the eye-candy, it has always maintained the best of usability under the hood of KDE. Bugs, problems, and issues are promptly fixed. That's reason why PCLinuxOS 2007 is so stable. While tinkering .92 and .93a versions of PCLOS I sometimes messed up the settings, but 2007 is so tightly integrated that you will always get a healthy desktop, no matter what you do in terms of tweaks and tinkerings. Of course, you can break the system as a root user, and that's a no-excuse case, you can break your BSD desktop or Debian also. The PCLinuxOS community is positive and helpful. Documentation is excellent. Support is excellent.I found the PCLinuxOS forum to be very friendly. And PCLinuxOS magazines are so enlightening that I religiously read every issue of it. It has always helped me to use PCLinuxOS better and understand the OSS and Linux further. I feel very elated getting answers to my questions from PCLOS developers, sometimes from Tex, himself! Very very right. The pace has been improving steadily. My PCLinuxOS 2007 desktop boots in 30 seconds. I am sure it will improve further in the next version which might come with KDE 4. Well, I use every bit of it. The CLI apps, KDE apps, PCC, Synaptic and the Init setups, everything has worked fine for me. I have just one request to Tex - "Please add wordnet as a default PCLOS application. Every desktop user needs it." Partitioning, Installation, Network Setup and User Administration, everything is simple, plain and fast. PCLinuxOS 2007 installs on my system in just 10 minutes from the time I popped up the disk. Need I say more! It doesn't require the largess and financial backing of a millionaire to keep it going. Watched the movie Godfather? Remember the dialogues? PCLinuxOS is the Michael of Godfather, it's way ahead the desktop war (Ubuntu, Mandriva, Fedora, Suse…) for its powerful personality that's a best combination of stability, usability and performance. Except that there are no Canonical-like patronage and Redmond-like corporate support. Linux geeks love the Command line, because it is simple, fast, cool and highly intuitive. Besides, it offers more options to do certain task. For example, compare video encoding in mencoder (the cli program that often comes bundled with mplayer) with any other gui application. Using mencoder you can play with encoding changing the parameters the way you like, but while using a gui applications you can use only the preset values. Well, those who are unfamiliar with command line interface (CLI), don’t blame it on Linux. Forgot the old DOS ways of doing things? 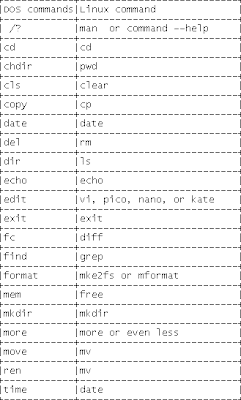 Don’t you remember that MS DOS which was as much cryptic as linux terminal, but unfortunately less powerful. You newbies please have a look at these command line comparison between DOS and Linux, so that you will never frown upon the good old CLI. Here is the table of comparison. Good justification. But certainly not unbiased! That sounds like pro-Linux prophesy. Let me explain how. Just read out your comments on the subhead "My hardware just works under Windows". Let me tell me I have been using Linux since the time when there were one three names on the block - Debian, Slackware and Red Hat, to this date. I have faced a lot of difficulty in searching device drivers. Though the condition is improving, but still sometimes I can get 100% performance from those devices. I don't say that Linux computing is bad at drivers, but the device manufacturers don't bother (may be can't afford) to build drivers for linux. There are n number of reasons, the important ones are - first, there are very less number of linux users and, second, there are just too many packaging types - rpms, deb, tarballs... and a lot, two many architectures, and what not. As an old school linux user I don't doubt the power and prospect of linux, but we have to accept that Linux users face difficulty in installing drivers. Let me give you two real life examples with linux driver scarcity. First one is getting linux version of Nokia PC Suite. Last week I purchased a Nokia 972 mobile phone. The box set included one Nokia PC Suite software that's installable only in Windows machines. I loved to use that suite to synchronize the mobile phone contents with my PC. But, I never succeeded. The second one is plug2surf indicom satellite internet connection. A major Indian telecom company, Indicom launched it satellite internet service Plug2Surf, by which you can access internet anywhere on the go. This is really a great service in India where the internet penetration is very less. But again that plug2surf software works only on windows xp/2000. I asked the Indicom people about "how could they ignore the linux users". They simply did not bother to answer my question. Besides, the above two issues. There are several other issues that blocks Linux from being a popular desktop OS. Take for example installing software. In windows its just click-n-go, but in Linux, it's never like that. You have sited the example of few application frontends like synaptic. But my dear synaptic downloads software, resolves dependencies and fixes the broken packages, only when your system is connected to the web. Do you have any idea of the third world where bare few people can access internet? How can one do hasslefree installation there. Again let me tell you another example. Last year I had been to my maternal uncle's, he lives in a village of south Orissa, Balijodi. In my PCLinuxOS notebook, I had downloaded just the rpm of wordnet but forgot to download its library package, libwordnet and the gui frontend. I could install wordnet only when I came back to my workplace Delhi. 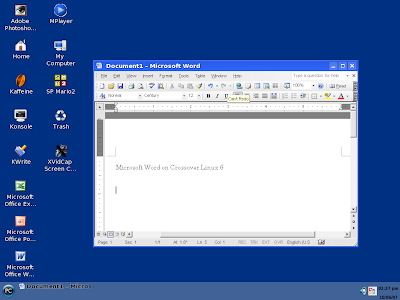 Compare wordnet in linux with its counterpart in windows world, wordweb. In most of the cases, windows software are packaged in just one installer, but in Linux there are several components - the apps, their libs, front-ends, compatibility with those apps with a particular desktop like gnome, kde, xfce, etc..... You have a good time installing software online. But offline installation is really a hell. And my dear, I would request you one more thing, "please don't presume that everybody has access to the web." In some parts of India, Pakistan, Bangladesh, Nepal, an internet connection is considered as a luxury. Let me conclude. I love linux the way i love my kids, the way i love my wife. And I respect linux, the way I respect my father, and the way I respect my teacher. I enjoy working in Linux, I learned to fix the things my way. I love to visit distrowatch to smell what's new on the linux platter. I know how much linux has improved since from kernel 2.4 to 2.6.22. And I am really happy on this achievement. But I am really worried about so much chaos in surface. Just imagine the tightly integrated microsoft windows desktop and, great but still the loose multitude of x desktops lilke kde, gnome, xfce, icewm...bla...bla.... Don't you think, had the linux developers put their unified effort to kde, we would have got a better and a tightly integrated deskto environment like windows? In addition to it, there are just so much chaotic things like - multiple packaging systems, a clutter of so many OS flavours with not much noteworthy differences among them. (Just consider pclinuxos with mandriva one, and mepis with kubuntu.... there is not much difference, the diversity is just the result of indivdual idiosyncrasy). People have been using Microsoft Office as an office productivity suite ever since the home desktop revolution started. Likewise they are using Adobe Photoshop, Winamp, some old Nintendo games etc. Most of them who have started computing in PCLinuxOS or other desktop linux such as Ubuntu, Mepis, Suse or Zenwalk, still can’t find the productivity from Microsoft Word and Adobe Photoshop from their Linux counterparts such as OpenOffice.org Writer and GIMP. Besides gaming in Linux World is not much of a phenomenon in comparison to gaming in Windows World. Chills to them who are using Linux but still retaining the copies of Word, Photoshop and games. They can now use those Windows software on their Linux desktop. Crossover Linux 6 makes it possible for every Linux user to use some versions of Flash, Dreamweaver, Framemaker, Photoshop, Microsoft Office, some games and many win32 applications to run on Linux Desktop. They can enjoy the benefit of Windows productivity and Linux Safety. 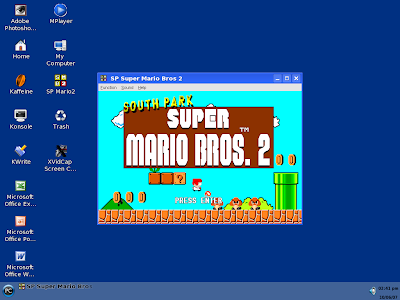 On my home PCLinuxOS desktop (VIA Mainboard & Chipset + Intel P4 2.66) I tried Photoshop, Word, Winamp and Super Mario. All of them worked fine except for some minor flaws. I have been using GIMP for quite a long time, but I still longed for Photoshop. Gimp has no option to use spacebar (which is quite common in Photoshop) to browse though the image while editing. Besides animated GIF creation in GIMP has always been painful. (Hope GIMP developers will soon incorporate these features). I purchased a copy of Crossover Linux 6 online. Installing Crossover Linux 6 was damn easy (Another version - Crossover Linux 6 Pro is also available but functionality of both general and pro are almost similar, for a home desktop I will never recommend the pro version). I got an rpm and installed Photoshop 6 in its win2000 bottle (you have option to install in win98 bottle also, keep in view the Microsoft application compatibility). One frustration is that Crossover offers installation only upto Photoshop 7 whereas the computing industry uses Photoshop CS3. However, home desktop users will be fully satisfied with Photoshop 6 (that’s what I use), no need to ride on CS3. As you can see in the screenshot, on Linux, Photoshop docked panels also occupied positions in deskop bottom panel. We may blame Microsoft Office many ways, but fact is that it rules all the office productivity suites. Microsoft’s usability is perhaps at its best in its office suite – the great contextual menus, handy reference and blazing fast behavior (characters are true only upto 2003 version, 2007 version has killed many of these great characters to be a little eye-candy). OpenOffice.org is good but compatibility with Microsoft documents is never perfect, besides it’s a way too slow. Microsoft Office installation was seamless. It was installed in less time on my PCLinuxOS than it might install on any Windows OS. I did a custom installation of only Word, Excel and PowerPoint. I use Thunderbird as my home mail client, so there was no point installing Outlook. Gaming on Windows has always been great. On top of Crossover Linux 6 I installed Half Life, Mario, AceRacer and many others. But I loved the old world game Mario the most. 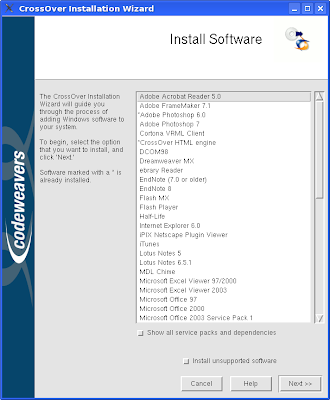 Including the above applications, Crossover Linux supports many win32 software. Try them and put your thoughts here. Last night I had a problem - I messed up my good-old xmms. The default PCLinuxOS in my system had amaroK, the versatile music player in Linux World built for KDE. But I rarely used it for several reasons of which the most painful is “slow startup and response.” My favorite is XMMS, the darling of every music lover who has been using Linux for past couple of years. Sad... half an hour later I ran XMMS and lo… it’s gui opened but it could not play any media player. Then came the loop of installation and removal. I removed XMMS and libXMMS and did a fresh installation again through synaptic so as to resolve all the dependencies. But that never worked again. If you are reading this blog. Please try it at home and if you are able to fix this problem, please let me know. As for now I am happy with Kaffeine, it plays both audio files and video files.